Morley, J.t.. "Social Credit". The Canadian Encyclopedia, 28 May 2018, Historica Canada. https://www.thecanadianencyclopedia.ca/en/article/social-credit. Accessed 18 April 2019. Social Credit Party Leadership Convention, Ottawa, July 1961, Réal Caouette and Robert Thompson (courtesy Library and Archives Canada/PA-115139). 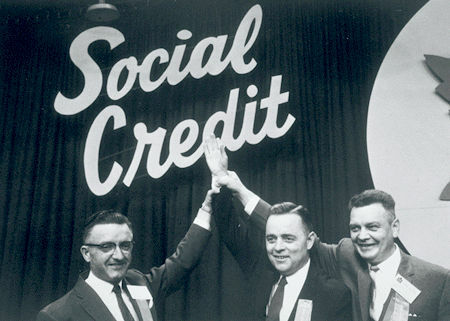 Social Credit is the name of a conservative political movement in Canada that was especially successful in British Columbia and Alberta, governing those provinces for lengthy periods of the 20th Century. The term Social Credit describes an economic reform doctrine, concerned with the redistribution of capitalist wealth to benefit consumers. Social Credit is a reform-oriented economic doctrine that for a time was influential in Canada. Social Credit's principles were formulated by an English engineer, Major C.H. Douglas (1879–1952). He argued that economic hardships resulted from an inefficient capitalist economy that failed to provide people with enough purchasing power for them to enjoy the fruits of a society's economic production. Douglas advocated the distribution of money, or social credit, so that people might have enough income to purchase the goods and services readily produced in society. His credit distribution system — which focused on people as consumers — became known as the "A plus B theorem." 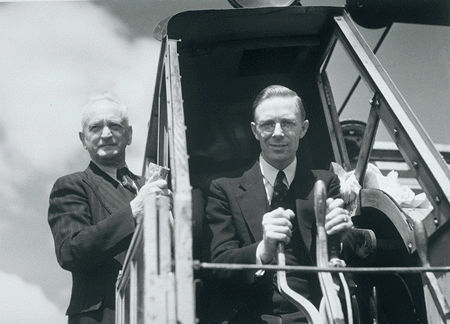 Douglas's doctrine had little political impact elsewhere in the world and likely would have remained relatively unknown in Canada, except that in 1932 Alberta evangelist William Aberhart became converted to it. He used his Christian radio program to encourage other Albertans to adopt Social Credit as the means of rescuing the province, and Canada, from the drastic effects of the Great Depression. In 1935 Aberhart led the new Social Credit Party to victory in Alberta, capturing 56 of 63 provincial Legislature seats with 54 per cent of the popular vote. It became the world's first Social Credit government. The party, first under Aberhart and then, after his death in 1943, under Ernest C. Manning, won nine successive elections and governed the province until 1971. This remarkable success resulted in part from the replacement of social credit fundamentalism, with conservative financial and social policies that even bankers could applaud. Success was also made possible by the careful use of massive oil revenues that flowed into provincial coffers after 1947. 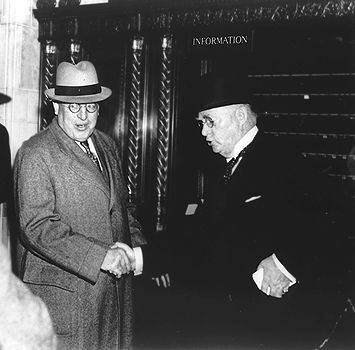 William Aberhart with Prime Minister R.B. Bennett (right) (courtesy PAA). Ernest Manning posing at a wartime housing project, June 1943 (courtesy PAA/B157011). In 1952 a Social Credit government under W.A.C. Bennett was elected in British Columbia. Bennett paid no attention to Social Credit doctrine, but combined a mixture of conservative financial policies with aggressive development schemes. 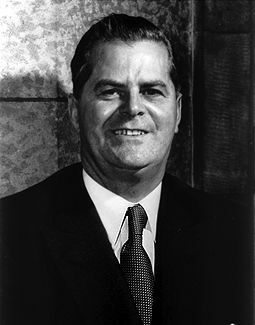 He governed BC in the name of Social Credit for 20 years, and his son William R. Bennett, became premier in 1975. William Bennett was succeeded by William Vander Zalm as "Socred" premier in 1986. During the 1950s and early 1960s, Social Credit parties were also successful in sending a few members to the Saskatchewan and Manitoba Legislatures. Bennett proclaimed himself a Canadian but had prolonged disputes with the federal government (Canapress). In 1935 the federal Social Credit Party won 17 seats in the House of Commons, including 15 from Alberta. The federal party's support gradually declined in Alberta until 1968, when it became insignificant. During the 1950s and early 1960s the federal party won only a handful of federal seats in BC. 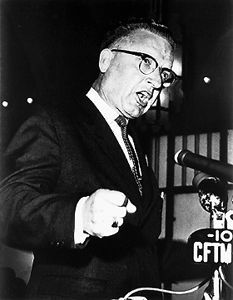 Under the Québec leadership of Réal Caouette, the Social Credit Party obtained 26 House of Commons seats in Québec in the 1962 general election. 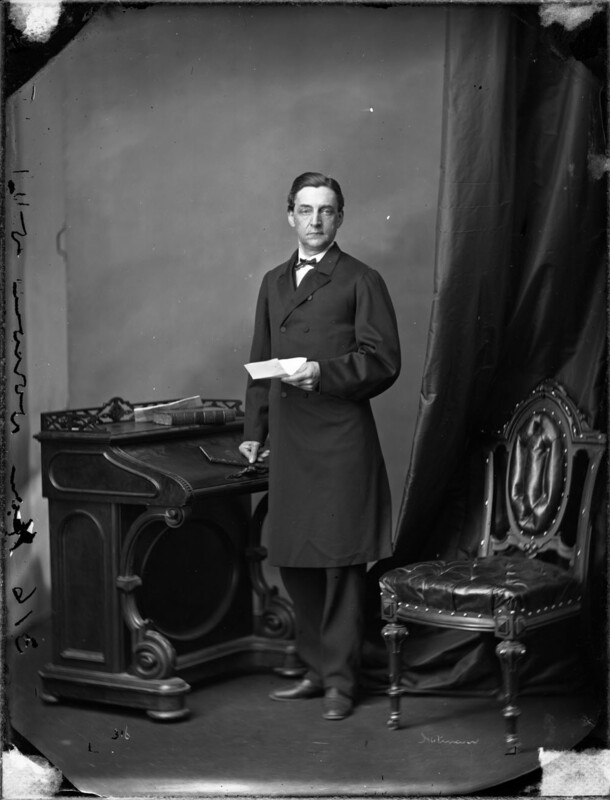 The national leader at the time, Robert Thompson, was responsible for a scant four more seats in the rest of Canada, including his own. Tensions among the MPs, created by this imbalance and exacerbated by the party's pivotal position in a minority parliament, led to a split in 1963. Caouette formed his own group, the Ralliement des créditistes. 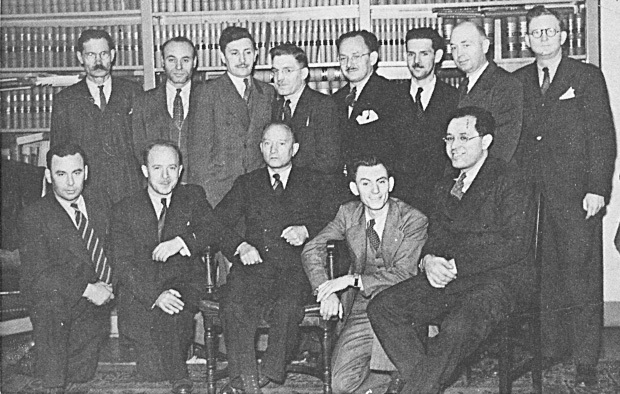 The federal party — both Social Credit and Creditistes — continued to have representation in Parliament until 1980. Caouette became a national political force as leader of the Québec Social Credit movement (courtesy Library and Archives Canada/C-87201). By the 1990s, Social Credit had weakened as a viable political force in Canada. In the 1993 Alberta election, Social Credit ran 39 candidates without success. In British Columbia, the party continues to use the "Socred" name, but has severed inks with Social Credit groups in the rest of the country and remains a relatively mainstream conservative party. The "Socreds" ran candidates in the 2001 and 2005 BC elections. Today, parties affiliated with Social Credit are generally considered to be on the political fringes.